Engage students with examiner Sue Pemberton's unique, active learning approach. 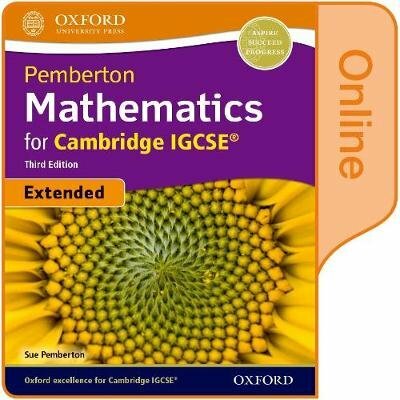 This new edition is fully aligned with the Extended part of the latest IGCSE syllabus, for examination from 2020, and contains a comprehensive mapping grid so you can be sure of complete support. Help students truly master every topic. and achieve their full exam potential with worked examples, step-by-step explanations and plenty of practice. The clear language and progression of content develops EAL students' subject and language knowledge. Take learning further with extra revision material and worked examples on the accompanying support site. This Student Book is also supported by a comprehensive Teacher Guide. This online Student Book will be available on Oxford Education Bookshelf until 2028. Access is facilitated via a unique code, which is sent in the mail. The code must be linked to an email address, creating a user account. Access may be transferred once to an additional user.